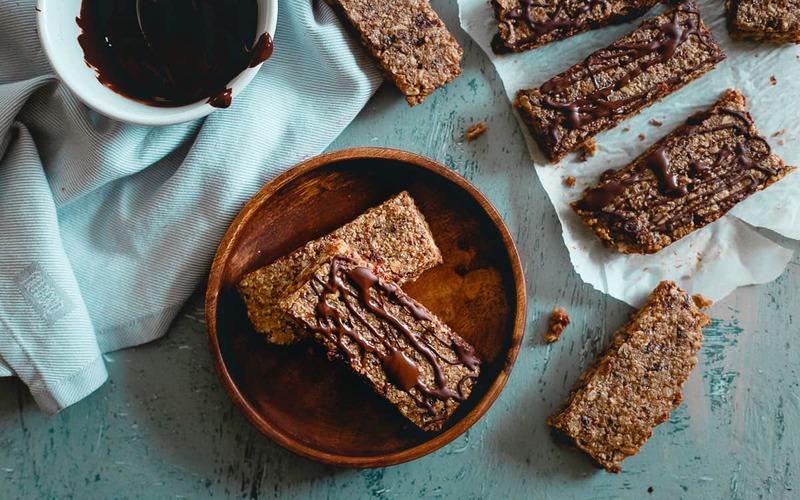 These Montmorency tart cherry oat bars are super chewy with an optional chocolate drizzle. Perfect for snacking or fueling up for a workout! There are two kinds of people in this world: those that prefer their chocolate chip cookies with crispy edges and a crunch to each bite (I’ll never understand you people) and those who are all about the soft batch, chewy cookie love. This division holds true for brownies as well (cake vs. fudge – I’ll let you guess which camp I’m in there) and I’m gonna go out on a limb and say we can add granola bars to this list as well. I won’t name names, but that certain brand that shoves two hockey puck-like bars into a little green package and you feel like you might lose a tooth when trying to bite into one, they’re everything wrong with the granola bar game as far as I’m concerned. Beyond the fact that nothing edible should be that hard, let’s discuss the mess a granola bar like that makes. Since these are usually an on-the-go/eat-in-your-car kind of thing, if you’re anywhere near as crazy about the interior cleanliness of your vehicle as I am, a crunchy granola bar that leaves more crumbs in the abyss between the driver seat and center console where all rogue food particles go to die is just not ok. So, I set out to create my own granola bar, a chewy tart cherry oat bar in fact. One where all (or at least most) pieces end up in your mouth, where they belong. 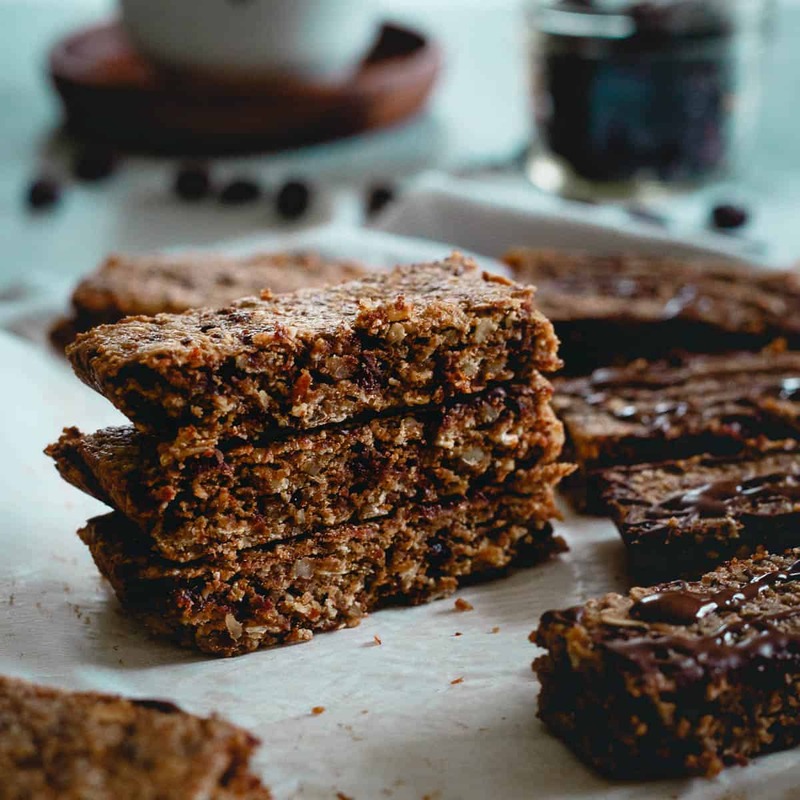 Given the amount of people flocking to the gym this time of year and looking for ways to eat a bit healthier, these tart cherry oat bars are the perfect snack to throw in your gym bag. 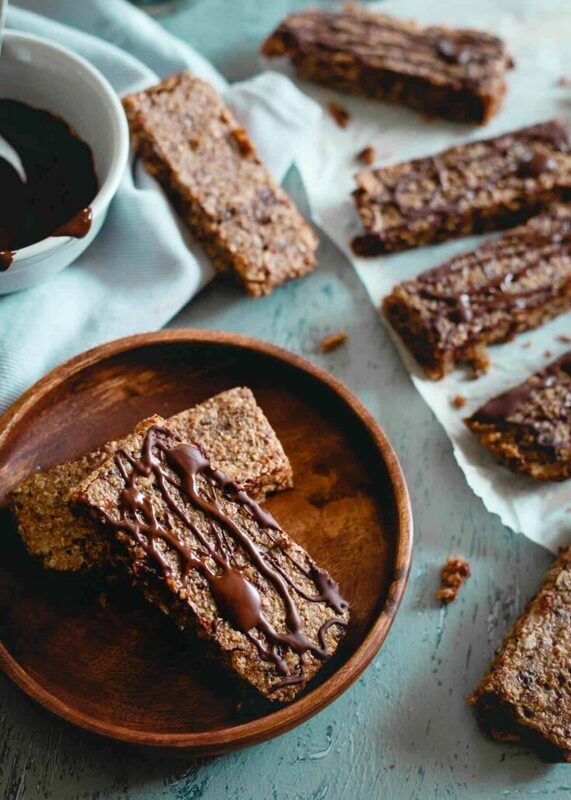 Whether you eat one before your workout to fuel up or after for recovery, they’re a healthy balance of carbs, protein and fat all in one delicious, semi-sweet, chewy (chocolate-optional) bite. They’re also delicious slathered with some nut butter on top or crumbled into Greek yogurt for even more protein. I’ve eaten them every which way. The dried Montmorency tart cherries in these aren’t just there because they taste good (although they do!). Their tangy, sweet bite is not only a great binding agent for the bars but they bring a whole host of potential health benefits to the table too. With their anti-inflammatory properties that may help to alleviate muscle soreness after workouts to their natural melatonin for a better night’s sleep, these little guys pack a nutrient punch. 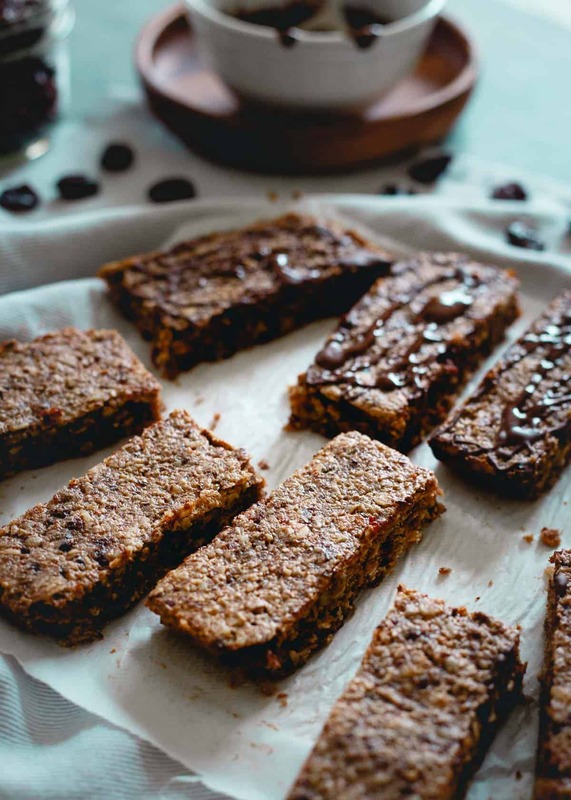 Instead of reaching for that box on the store shelves, give these chewy tart cherry oat bars a try, wrap them up individually for easy eating on the go and I’m betting you’ll never look back! Also check out these cherry power cookies or this tart cherry fruit leather – two other great snack options! Combine the dried tart cherries and nuts in a food processor and pulse until finely chopped. Transfer to a large bowl. 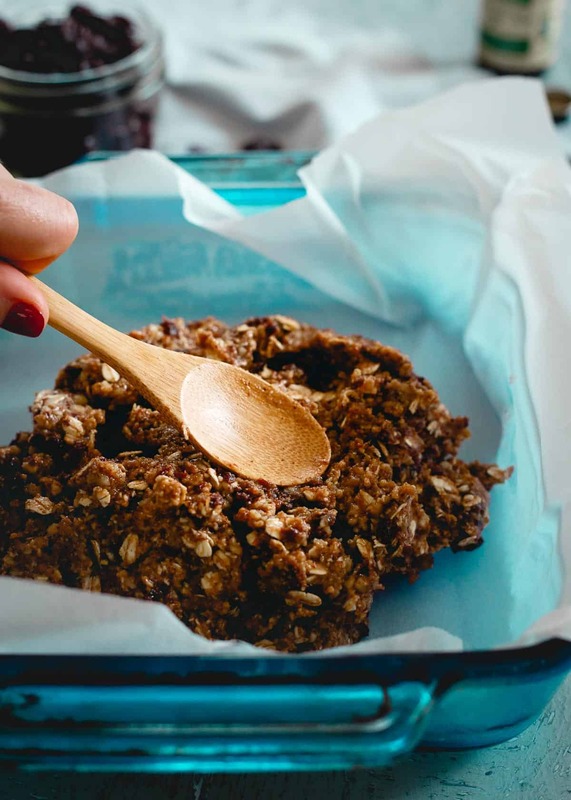 Add the oat flour, dates, kosher salt, vanilla, egg and almond butter to the food processor and process until a sticky dough forms. If mixture sticks together easily when pinched, you have the right consistency. If not, add a drizzle of water with the processor running until it comes together. You won't need much! Transfer mixture to the large bowl with the cherries and nuts. 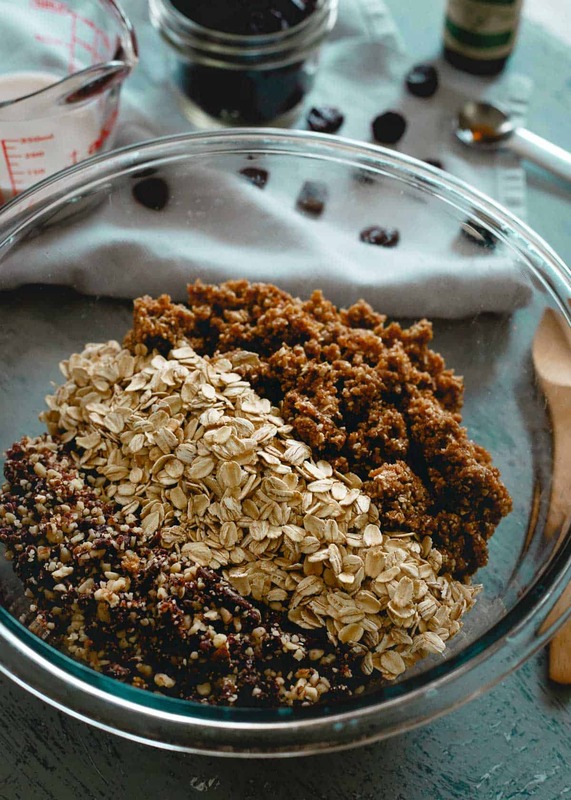 Add the oats and almond milk to the bowl and stir to combine until ingredients are evenly incorporated. It's easiest to use your hands for this. Transfer mixture to the lined baking dish spreading out evenly and into the corners. Bake for 20-22 minutes until firm to the touch and edges start to turn golden brown. Remove from oven, set dish on a cooling rack and let cool completely before cutting into 10 equal sized bars. If doing optional chocolate drizzle, melt chocolate and coconut oil in a small bowl and stir until combined. Remove bars from the baking dish by pulling the sides of the parchment. Use a spoon to drizzle chocolate all over bars. Let chocolate set (you can place them in the freezer for a few minutes to speed this process up) then cut into 10 equal sized bars. 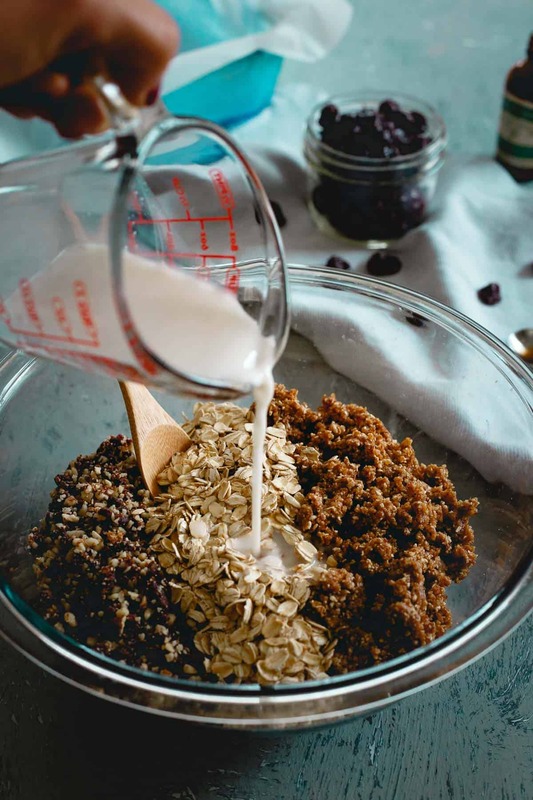 -Make your own oat flour by placing 1 cup of rolled oats in a food processor and processing until a fine flour consistency results. 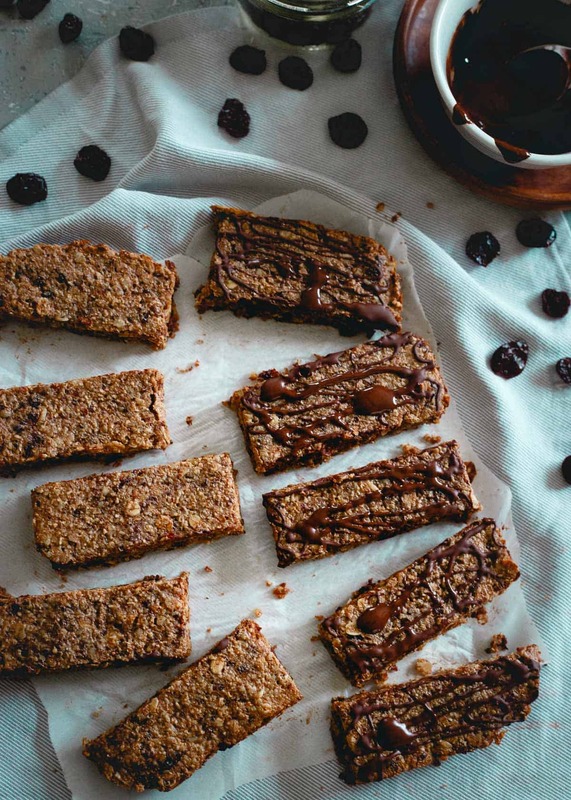 Chewy granola bars are the ONLY ones worth eating! I love cherries, so I MUST try these! I love the combination of cherries and chocolate!! This looks awesome! I LOVE tart cherries! They are such a wonderful anti-inflammatory, I add them to my smoothies! I need to make these bars ASAP! I’m also all about those chewy, gooey cookies. I always seem to be in the minority – more for us, I guess! These look so good. My favorite ice cream growing up was Ben & Jerry’s Cherry Garcia, so obviously these are a must-make. That ice cream is the best, my favorite too! My gym was packed today Gina! UGH!! These would be the perfect little snack after working out! Maybe even one before!! I’m a HUGE snacker, so I need these in my life! These sound so good! I love a chewy bar! Snacks for the win! These look so crazy good! Bring on the chewy-ness!